A Radical Awakening for Deep Ecologists, EcoProtectors, EcoWarriors, EcoArtists, EcoHomeys, EcoCurious, GreenJeans, and of course, EcoYogis in the Greater Newark Area NJ. Let’s go deep! It’s a first for NCMC — an entire month with one theme — that of urban nature, deep ecology, our ecological consciousness, and environmental issues. Programs will range for kids, teens, and adults. We’ll be planting seeds of understanding and hope, planting seeds of action, and maybe even planting some real seeds! We want to uncover our True Nature so that we can wake up to think and act both radically and in equibalance with our ecological self, others, and our environment. We want to get down to the root of the problems, help uproot them, and plant new positive roots, especially in our children. This is so urgent in this time of Unrest and Climate Change. 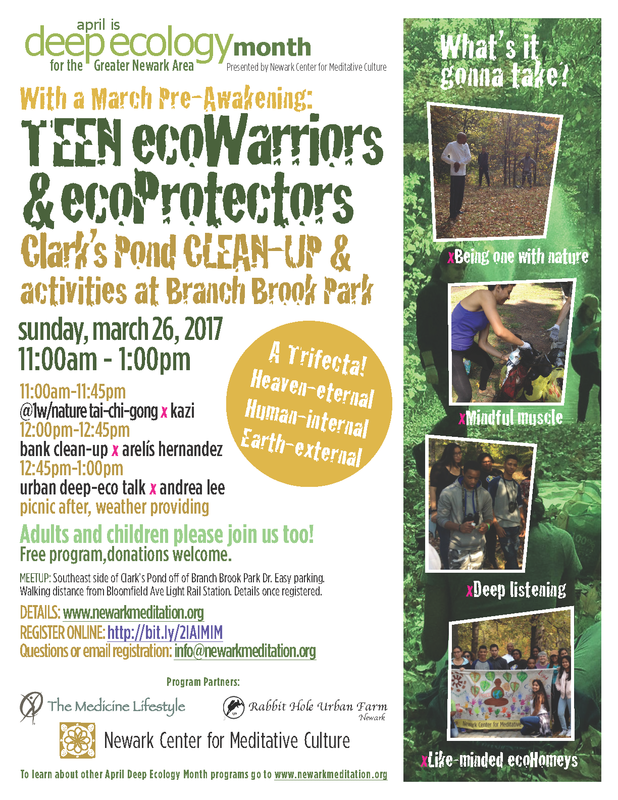 These sensitized, educational, and mindfulness-based programs include a teen and family park clean-up, easy nature hikes, meditation sessions, ecoTalks, and a kids and teens farm workshop. 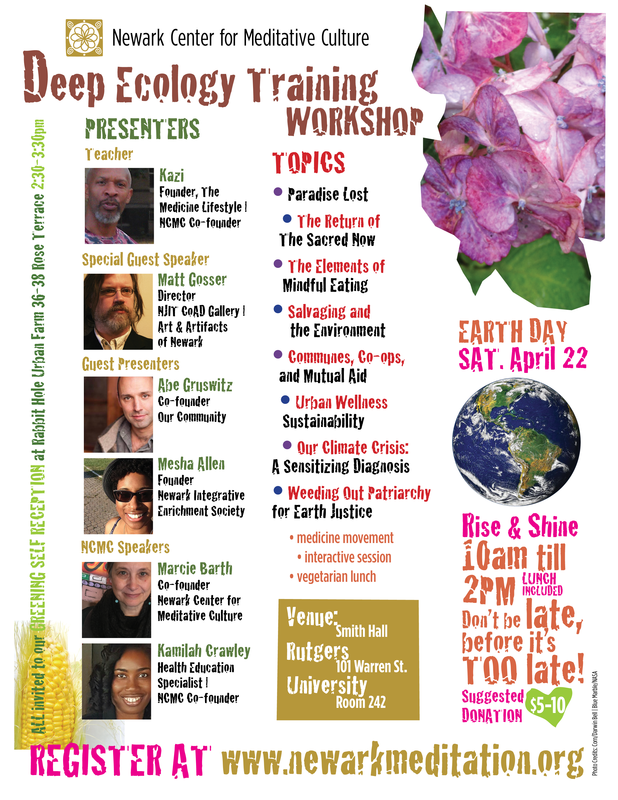 Most important for adults will be the Deep Ecology Training Workshop to be taught by Kazi at Rutgers on Earth Day, April 22nd, that will make connections between environmental issues and world problems including racism, war, poverty, pollution, agri-business, to name a few. Our collaborators and supporters for these programs include The Medicine Lifestyle, Hikeolution, and 4-H Youth Development Program of Essex/Hudson Counties at Rutgers. 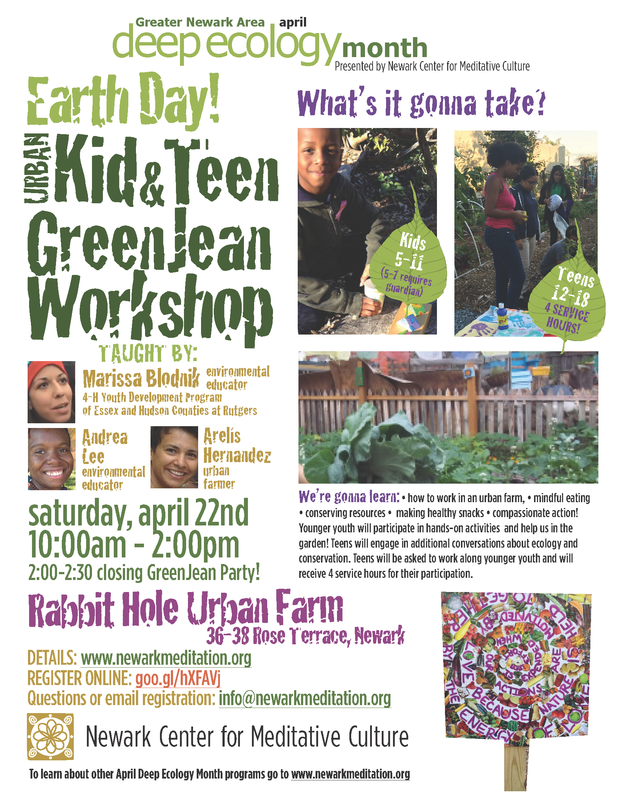 Program meals are to be catered by Rabbit Hole Urban Farm at 36-38 Rose Terrace, Newark NJ. We also greatly appreciate the use of classroom space at Rutgers University. These programs are free, though we do certainly welcome donations that help to gift the teachers and cover other program expenses. Please take a look below and save some of these dates. Flyers for each program are also posted, so do scroll down all the way. We ask that you REGISTER for these programs using our online forms (preferred) or by email at info@newarkmeditation.org so that we can plan thoughtfully. Communing with nature and community service is what this is all about. Activities will include tai-qi-gong with Kazi, Clark’s Pond bank clean-up with Arelís Hernandez, and we’ll end with a deepEco talk by Andrea Lee. We’ll enjoy a picnic lunch together, weather providing. Kids and adults welcome too. For aged 14 through adult, biological or male identified. 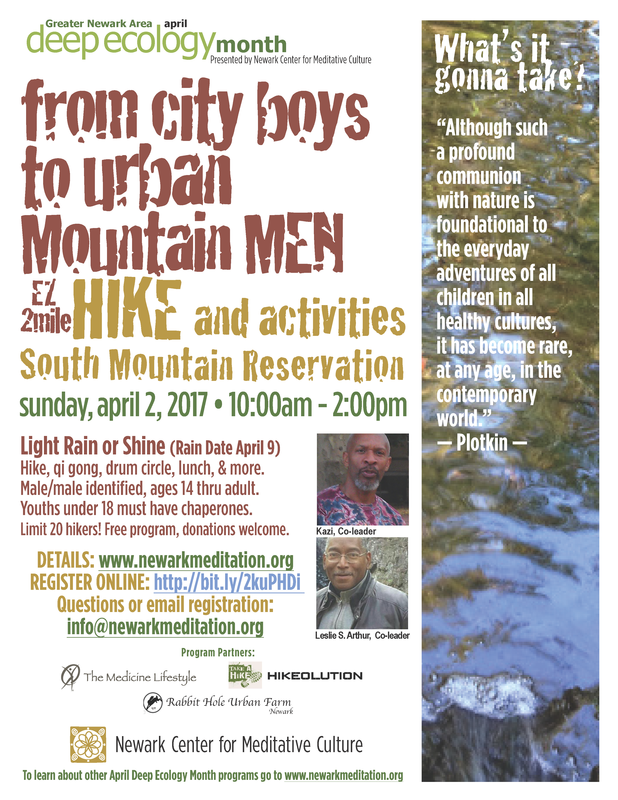 Hike will be led by experienced hiking guide and wellness-spiritual coach Kazi and co-led by hiking leader Leslie S. Arthur. Other activities include tai-qi-gong, a drum circle, lunch, and more. For aged 14 through adult, biological or female identified. 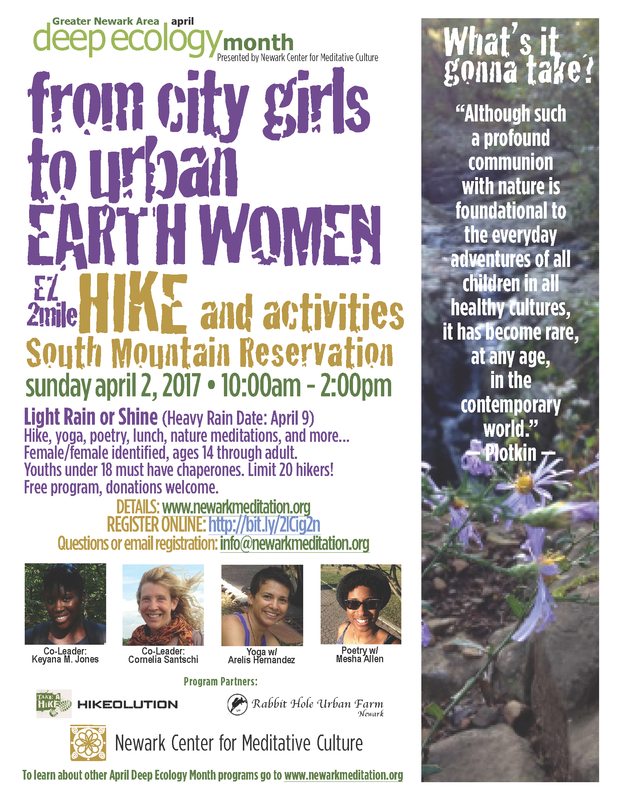 It will be co-led by hiking guide Keyana M. Jones along with meditation teacher and avid trekker Cornelia Santschi. Other activities will include poetry with Mesha Allen, yoga with Arelís Hernandez, nature meditations, lunch, and more. This is our standard weekly meditation group, but for Deep Ecology Month our readings and discussions will focus on the four elements of earth, fire, water, and air — internal expressions, external environment, their causes and effects, and compassionate actions to take to create equilibrium. Instructor and peer-led. This workshop taught by Kazi is meant to be an intense immersion into DEEP ECOLOGY to make a comprehensive connection between our environmental issues and our world’s problems. Special guest speaker is Matt Gosser, current gallery director at NJIT, previously urban planner and architect who salvages and up-cycles. Other guest speakers are Abe Gruswitz expert in cooperative and communal living and Mesha Allen an urban wellness champion. Also presenting are Marcie Barth an NCMC co-founder and Kamilah Crawley a public health education specialist. All day compassionate activism, Washington D.C.
We encourage anyone who can to join this march on your own, with friends, or with your group. It’s a chance to walk the talk at what is to be a HUGE climate change march with 350.org and partners. NCMC hopes that you or your youth will find one or two of these programs inspiring enough to attend!